CAPE CANAVERAL, Fla — Colorado-based United Launch Alliance (ULA ) has the most powerful version of the Atlas V, in its 551 configuration, ready for flight. The payload for the planned Jan. 20 launch is the third Mobile User Objective System (MUOS-3 ) satellite. If everything goes according to plan, MUOS-3 will take to the skies from Cape Canaveral Air Force Station’s Space Launch Complex 41 (SLC-41) in Florida at 7:43 p.m. EST (2343 GMT). Tomorrow’s flight will mark the first launch of the year for ULA – which has some 13 launches on the manifest for 2015. MUOS will be a fleet of geosynchronous satellites that are being deployed on behalf of the U.S. Department of Defense (DoD). Tomorrow’s flight will deliver the third of five planned MUOS spacecraft to orbit which will relay their data back to four ground stations. 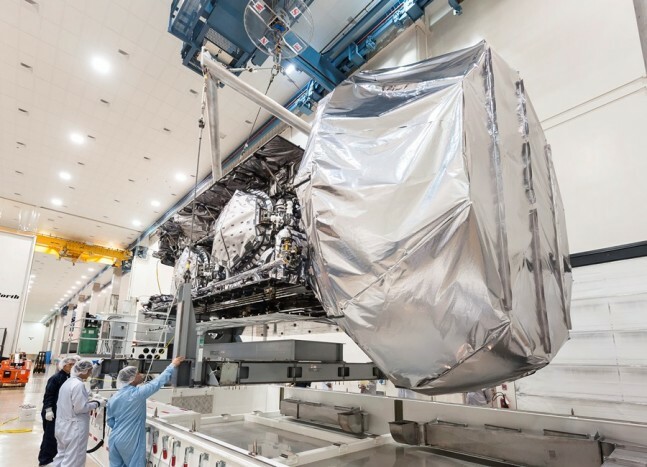 These satellites are designed to provide narrowband connectivity at a rate of about 384 kilobytes per second. MUOS is a Ultra High Frequency (UHF) system that transmits in the 300 MHz to 3 GHz frequency range and is meant to replace the UHF Follow-On (UFO) satellites currently in service. The five MUOS spacecraft are being sent aloft so as to provide improved mobility, accessibility and capacity and are primarily for use with mobile platforms, such as vehicles, aircraft or ships at sea. MUOS satellites are capable of relaying voice transmissions, video or data beyond line of sight. The fleet will consist of four operational spacecraft and a single on-orbit spare. The lead developer on MUOS is the United States Navy’s Communications Satellite Program Office of the Program Executive Office for Space Systems – based out of San Diego, California with Lockheed Martin serving as the prime systems contractor and designer. The contract, N00039-04-C-2009, was announced in September of 2004. If everything goes according to plan, the complete fleet of MUOS spacecraft should be on orbit this year (2015). MUOS serves as a global service provider for troops in the field, providing them with, essentially, cell phone capabilities. The fleet will convert third generation Wideband Code Division Multiple Access (WCDMA) to a military-based UHF SATCOM radio system. Instead of utilizing of cell towers, the system will use geosynchronous satellites. In so doing, the MUOS fleet will be able to provide communications services – even in non-industrialized parts of the world. This includes jungle locations, a normally restrictive environment due to thick forests. The cost-plus-incentive-and-award-fee for MUOS has been estimated at costing approximately $2.1 billion and is based on a period-of-performance period of seven years. This is comprised of a baseline consisting of just two spacecraft as well as the related ground control components. Contract options, if they are selected, could add an additional four years and $1.1 billion to the base amount and in so doing bring the total cost of MUOS to $3.2 billion. Besides Lockheed Martin, other companies contributing to the production and fielding of these spacecraft include General Dynamics, Boeing, and Harris Corporation. 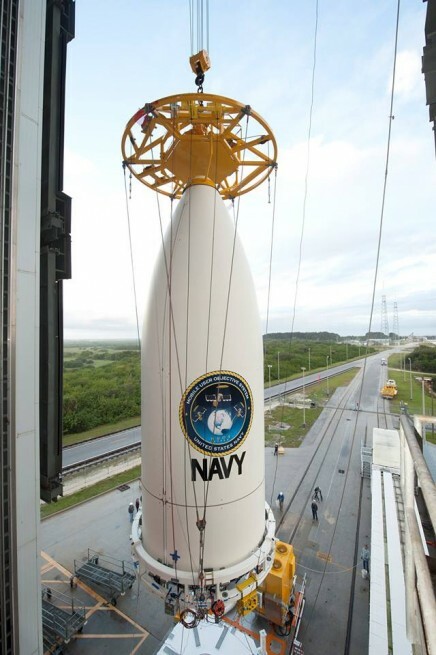 The MUOS-3 spacecraft was delivered to Cape Canaveral on Nov. 6 of last year and was encapsulated into the Atlas V Payload Fairing or “PLF” on Dec. 19, 2014. “With the launch of the third satellite in the constellation, to be followed later in 2015 by the fourth, MUOS will be in place to provide pole-to-pole and global, secure communications for the warfighter,” Bombelyn said. As noted, MUOS-3 will ride the 551 configuration of the venerable Atlas booster. This version of the rocket has a 5.4-meter payload fairing (PLF), five Aerojet Rocketdyne AJ-60A solid rocket motors or “SRMs” and a single Aerojet Rocketdyne RL-10A engine in it Centaur upper stage. The first stage uses an RD-180 rocket engine, which is produced in Russia by NPO Energomash, is capable of producing more than 860,000 lbs (3,825,471 kN) of thrust at liftoff with a specific thrust of 311 seconds. The engine burns a mixture of liquid kerosene and liquid oxygen or “LOX” as fuel and utilizes a two-thrust-chamber. The engine is also equipped with hydraulics for control valve actuation and thrust vector gimbaling, pneumatics for valve actuation and system purging, and a thrust frame designed to distribute loads. According to ULA, the RD-180 measures some 140 inches in length and weighs about 12,081 lbs (5,480 kg). Each of the AJ-60A SRMs that the Atlas V will use to raise the MUOS-3 spacecraft to the proper orbit measures some 787 inches (1,999 cm) in length, 62.2 inches (158 cm) in diameter and weighs 102,950 lbs (46,697 kg). The SRMs have a normal burn time of about one minute and 28 seconds and unleash 380,000 lbf at peak thrust in a vacuum. The Atlas V’s upper stage measures about 92 inches (234 cm), has a diameter of 46 inches (117 cm) and uses an RL-10A engine for thrust. The RL-10A uses liquid hydrogen and liquid oxygen as propellant. The engine has nearly 400 flights on record and has performed almost 700 firings in space. The RL-10A has a thrust of about 23,300 lbs with a specific impulse of about 451 seconds. 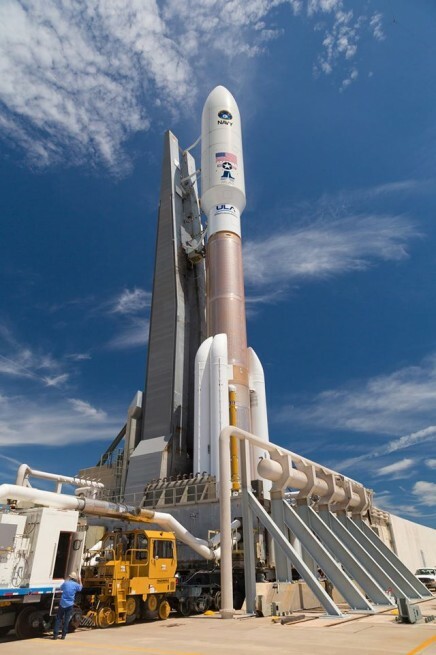 The Atlas V variant of the rocket has been in service since 2002, with the rocket proving its viability with a near perfect success rate (only a single mission has been listed as a partial failure – the flight of NROL-30 / NOSS-3 in June of 2007). The rocket’s various components hail from points across the continental United States and abroad. Facilities located in Decatur, Alabama, San Diego, California, Harlingen, Texas and Denver Colorado – all play their part. The booster’s first stage engine, the RD-180, is produced by NPO Energomash and the fairing, the shield for the rocket’s precious cargo, comes from Zurich, Switzerland. When all is said and done, the 551 is capable of ferrying 40,786 lbs (18,500 kilograms) to low-Earth orbit (LEO), 8,730 lbs (3,960 kilograms) to geostationary orbit (GEO), and 19,180 lbs (8,700 kilograms) to a geostationary transfer orbit (GTO). The Atlas V 551 has, as was the case with NASA’s New Horizons mission to the dwarf planet Pluto and the Juno mission to the planet Jupiter, demonstrated the capability to send payloads on Earth-escape trajectories as well. A typical Atlas V 551 stands an estimated 203 feet (62 meters) in height and has a diameter of about 12 feet (3.8 meters). At liftoff, the launch vehicle has a mass of approximately 1,294,113 lbs (587,000 kilograms). The V 551’s first stage measures some 107 feet (32.5 meters) in length, and is fueled by a mixture of Rocket Propellant 1 (RP-1), a highly-refined version of kerosene along with liquid oxygen, which serves as the oxidizer. The thrust produced from the RD-180 is directed through two nozzles. These nozzles in turn can each be maneuvered about 8 degrees and, in so doing, direct the rocket on the proper heading so as to deliver the payload to the proper orbit. The launch of MUOS-3 will be the first launch of the year for ULA, which launched fourteen missions in 2014. The RD-180 is described in greater detail in this SpaceFlight Insider article by Florida Institute of Technology intern Amoree Hodges.